Our New World family would like to introduce an addition to our charitable affiliations with Barnardo’s, in the form of our first fully fitted greenhouse as a result of our ‘Grow with us pledge’ from The Botanist brand. The beautifully spacious garden of The Indigo project in Ilford became the new home for our 6ft by 8ft greenhouse and was erected by our very own team; Katie Longbottom, John Hogg and Vikki. After eight hours of construction the team were surprised and touched as the sky poetically displayed the perfect rainbow over their heads, almost like a subtle approval from the universe for their efforts. We are honoured to provide such a deserving establishment the chance to further their facilities and grant locals the chance to better their health through this project. We want to make a difference in children’s lives that may need a helping hand. On the 16th September, the centres’ doors opened for local children, young carers and their parents/guardians for their annual family day to explore the newcomer and have an exciting day filled with flavoursome vegetable based dishes and nutritious fruit smoothies at the pop juice bar. The purpose of our plan is to introduce a new greenhouse to the nearest local Barnardo’s centre alongside any new Botanist sites that open. We hope to promote a healthy lifestyle by educating children on sustainability for the environment and the importance of a balanced diet. We provided the seeds to be planted; covering all delicious and nutritious greens like spinach, broccoli, rockets and cabbage; the winter suitable vegetables were distributed by the parents and children who attended the family day. The fruit and vegetables grown in the centre are solely to be used for the local families to have ingredients for dinners and predominantly to educate children who lack the knowledge of a healthy diet. Some of the children didn’t know crisps were made from potatoes and that they are sourced from the ground. Many are used to quick and unhealthy foods that are easily accessible and cheap but bad for you. Parallel to providing the greenhouses we will be putting on 6 week cookery projects, where possible, with our talented chefs to reinforce and empower individuals to take their health into their own hands. We also want to continue on our journey with Barnardo’s and follow the individuals who benefit from the projects. We will continuously provide services and equipment that is essential to the efficiency of the facilities to create a continuous support system. 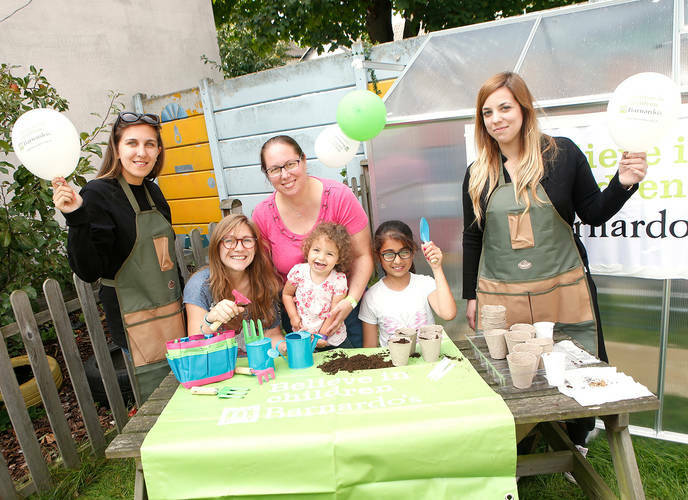 We will continue our ‘Grow with us pledge’ throughout the UK to spread our seeds of love and encourage the inspiring children of Barnardo’s.